← ZumaOffice.com Launches Enhanced Website – Buying Office Supplies is Now Even Easier! The Capital Area Food Bank recently announced that Zuma Office Supply captured 2nd place in the Small Business Challenge, a competition the food bank holds with businesses which recognizes organizations that raise the most food for hungry families during the holiday season. In total, Zuma staffers raised 2,147 meals during the month of December. Zuma was also recognized as the business that donated the most pounds of food during the competition. The challenge involved tracking volunteer hours performed by a business, the number of pounds of non-perishable food donated, and the total amount of monetary donations given. 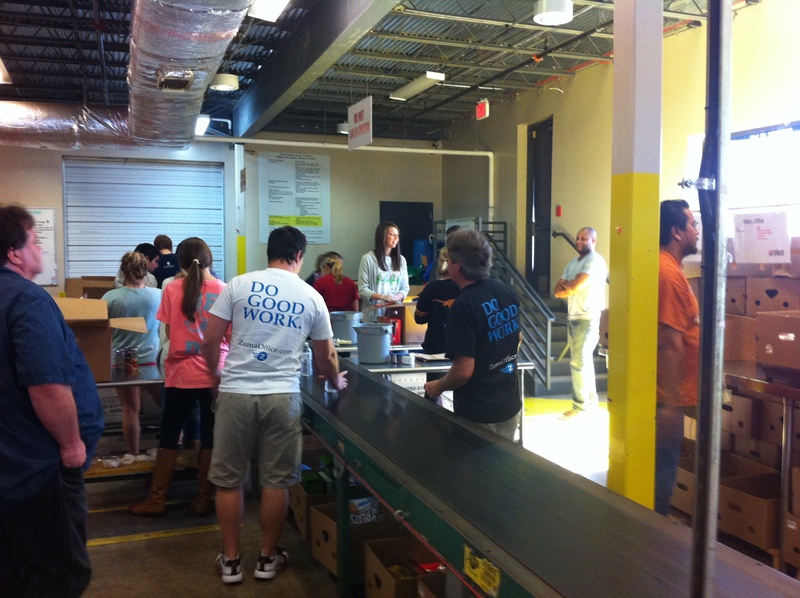 After totaling the activity of each business, the CAFB calculated the number of meals each company raised. 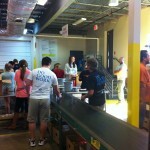 Zuma employees helping sort food at the CAFB warehouse. “We feel strongly at Zuma that doing good work means more than just donating money to great charities. Many charities need volunteer help almost as much as financial support, so we try and do our part with local charities when we can,” said Greg Pierce with Zuma. He added that the CAFB is flooded with food donations during the peak holiday period, so the Business Challenge really helps them bring in volunteer help during the busiest time of year. Click Small Business. Big Impact to read details and results on the Small Business Challenge from the CAFB website. Congratulations go to Starmount Systems, Inc for winning 1st place in the competition. They managed to raise 2687 meals to feed the hungry in December alone. Also recognized was Cohn Reznick Accountants who raised 1872 meals and took third place. Both companies truly do good work! If you are looking for a way to get involved in the community and do some quality volunteer work, Zuma highly recommends working with the CAFB. If you are interested in learning how you can do good work helping hungry families, click this How to Help the CAFB page. Enjoy! This entry was posted in Zuma Info and tagged Capital Area Food Bank, Giving Back, office supplies, Small Business Challenge, Zuma, Zuma Charities. Bookmark the permalink.